Sometime ago, I wondered if I have been spending as much time with Little Buddy, teaching, reading and playing, as I had with his elder brother. The thought that perhaps I had not been fair in my division of time stabbed me with guilt. So I decided that I will set aside a portion of my mornings to do just that with him. Yesterday, I started Little Buddy on some simple worksheets to introduce him to written work. Perhaps it was the novelty of a new activity or the opportunity to finally emulate his elder brother during Study Time, he was very receptive to formal written work. I confess I had harbored misgivings at his ability to concentrate sufficiently long enough to complete one worksheet. He surprised me with his enthusiasm and more than that, I was elated at his ability to comprehend the given instructions. 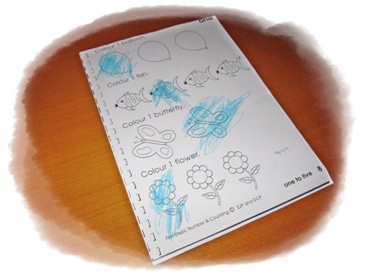 Here is the worksheet he spent time on this morning. I may be biased but I think it is an exceptional piece of work by a 32-month-old. After I explained what was required of him and gave basic guidance for the first problem, he easily completed the rest with no mistakes.